This review was first posted on Music, Books and TeaWither has been on my wishlist for a long time, so I was very excited on Christmas morning to get a copy of this book. 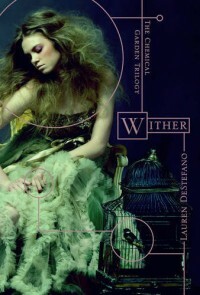 I've been reading to read more dystopian books in 2012, and figured that there was no better book to start with than Wither.What worked for me: Lauren DeStefano's writing style was absolutely flawless. I literally picked this book up and before I knew it, I'd read ten chapters. Her writing, the plot and the characters blended together to make an incredible book. I loved Rhine, she wasn't afraid to do what she had to do to escape from her new life and find her brother, even if it meant pretending to fall in love with Linden. 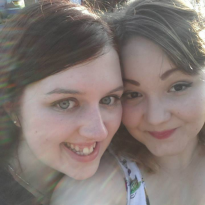 Her determination and strength made her a brilliant heroine, and I was routing for her throughout the entire book. The concept of sister wives was very interesting, and whilst I had some problems at first dealing with Cicely, I soon warmed to her and Jenna, and really began to care for them. I liked how Cicely was basically a parallel of Rhine, from her ideas to her actions. And I loved Gabriel. The book wasn't packed full with him, but there was just enough to make the ending work. What didn't work for me: Cicely's pregnancy creeped me out, as she was so young. I know girls in our world get pregnant at her age, but I was still slightly freaked out by that. I literally could not put this book down, and I cannot wait for the release of Fever. I'm interested to see what happens next with Rhine, Gabriel and Linden.